China, Japan, Hong Kong, Taiwan, and Sinapore represent 5.61% of Argentine wine exports. Whereas, the two main markets account for 4% of the total bottled wine exported by the country. This way, the wine consumption is concentrated in some destinations, and it is anticipated that there will be an exponential growth for Argentina. Wines of Argentina keeps doing a strong strategy to promote the Argentine wine in the Asian market. Apart from the fairs and specific event in which it participates, the entity strenghthens its aims by opening the office in Beijing, in Abril 2012. Moreover, Wines of Argentina together with Ease Scent, the most important platform of Chinese wine training industry, launched the first Argentine Wine School and online marketing promotions. The “Argentina Wine School” was established in April 22th, 2013 as a partnership between Wines of Argentina and Ease Scent with the collaboration of the EAS (Escuela Argentina de Sommeliers). The main objectives are: to boost the understanding of the Vino Argentino brand story among Chinese wine buyers, to allow Chinese customers truly comprehend Argentine wine and regions, to enhance the interaction with Chinese consumers and improve the reputation of the wines in China. Ease Scent, the exclusive partner in China of Wines of Argentina, arranged an influencing foundation ceremony for the school inviting the key leaders of the chinese wine media and practitioners. After the ceremony, the Argentina wine professional courses-Level 1 was set up in 6 different cities of China: Beijing, Shanghai, Guangzhou, Xiamen, Chengdu & Nanjing. At the same time, to promote Argentina’s news and culture in the online media, a marketing promotion at the biggest wine site of China, Wine.cn, was set. http://www.wine.cn/TopicsArgentina. The special section for Argentina cover 6 main topics such as: wine regions, grape varieties, travel channel, regional videos, splendid activities and Argentina wine relative latest news. According to a study made by Wine Intelligence, China will remain the most interesting Asian market for wine exporters. Nonetheless, the wine sector has to be ready to also take advantage of the opportunities offered by Japan, South Korea, Singapore, and even Taiwan, which are the main four Asian markets comprised in this study. Among the common trends in the whole continent, the report spotlighted that the most noticeable trend in Asia is to import affordable products suitable for daily use, mainly due to the fact that the wine is losing its image of luxury goods and is also attractive for younger consumers. 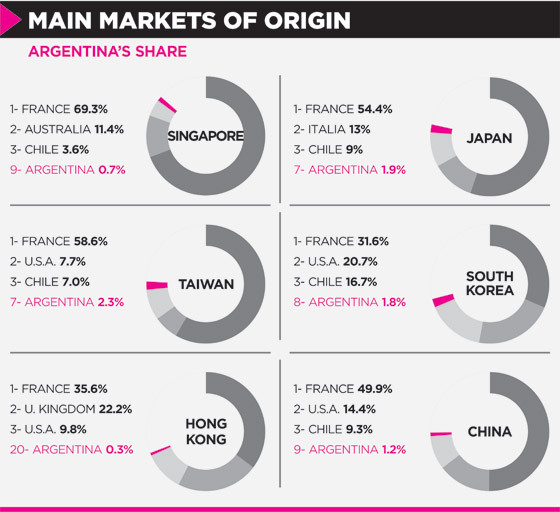 From Dante Robino, Roberto Monsalvo, marketing manager, insisted that although Asian markets are immature and the Argentine category is small, it is little by little growing in terms of interest and volume. This winery, according to Monsalvo, gets itself positioned with medium and high-end wines and sparklings. Among the best performing grape varieties in Asia, the executives of wine companies agreed that Malbec leads the ranking, because, according to Cavallo, “apart from being Argentina’s signature varietal wine, it is really versatile to pair with different dishes.” However, Trivento’s export manager maintained that Asians are not very familiar with Malbec yet. Afterwards, he said that classic varietal wines such as Cabernet Sauvignon and Chardonnay are always among the favorites. Likewise, Torrontés also keeps pace and is highly appreciated by Asian consumers, since one of its aromatic features is the “lychee”, a well-known fruit in Asia for which they have strong preference. This grape variety boasts a great potential to compete with New Zealand and Australia’s Sauvignon Blancs, according to the executives of the wineries consulted. Then, to Cavallo, Syrah is perfectly adapted to the Asian palate, but it competes heavily with Australia due to the strong identity with this varietal. Besides, Monsalvo included Bonarda in the list of emblematic grapes in Asia. In this respect, he pointed out that this variety is one of the best options offered by Dante Robino, which has been well appreciated in Asia. It is worthy to mention that Wines of Argentina carries out numerous training and communication actions. Likewise, in order to get closer to these potential markets, the entity continues organizing frequent Hospitality activities for the media, sommeliers, and the trade of Asia, sharing a great knowledge of Argentina and its wines. Trivento’s export manager-Asia highlighted that consumers have not a strong identification of Argentina with wine. For this reason, wineries are carrying out “different activities focused on education and training in Argentina’s history as regards the wine- making, terroirs, and distinctive features. We work closely with our importers/distributors on promotional actions, encouraging and adapting the communication to the language of each country. Moreover, we keep a good communication and contact with journalists and opinion leaders”. Monsalvo mentioned that Argentina and Dante Robino lay great stress on the value for money and presentation of Argentine wines. Other way of promotion in which Trivento is working on is developed by means of the specialized press, capturing the local opinion leaders, as well as calling the attention of international wine education centers. On the other hand, as regards trade, e problem mentioned by Trivento is that Argentina does not have Free Trade Agreement with the countries of the region as have European countries, Australia, New Zealand and Chile. “This is a tax advantage that favors them competitively, achieving a strong presence and positioning all over the region, “explained Cavallo. Diego Surazsky, Norton’s export manager, pointed out that in comparison with other countries, Argentina does not have a great representation of brand and business volume in the Asian market. However, in China, the country has grown by 15% in volume and 1% in value during the January-July period of 2013, attaining 240 thousand 9-liter cases and USD 10 million in terms of turnover, consolidating as the most important market for Argentina in this region. China has reached # 6 in the ranking of the most important markets for Argentina, followed by Japan, in # 10. The ranking also includes Singapore (#25), South Korea (#27), Taiwan (# 28), Hong Kong (#29) and other Asian countries. From Norton, Surazsky said that the average price in China is USD 45 per 9-liter case and in Japan, USD 35. “If we only consider the sparkling wine market, the latter market is the third most important one for Argentina in this category, and there, the average price per 9- liter case is USD 43. In Japan, Norton is the #1 brand of sparkling wine, with an average of USD 40 per 9-liter case, growing by 88% in volume from January to July in 2013, versus the same period of the previous year,” he explained.